Opinion Stage is a powerful & easy-to-use interactive content (e.g. polls, quizzes, surveys, lists, forms) creation service. Work for Opinion Stage Poll, Survey & Quiz Maker? Learning about Opinion Stage Poll, Survey & Quiz Maker? "IN LOVE WITH OPINION STAGE"
What I like most about Opinion Stage is definitely The Polls! I use them all the time and try to implement them to my content whenever I can. Definetly helps a lot with the content I post online as a food blogger and it is very user friendly so my readers find it easy to use it as well. I like that you can edit images, how many options you have in the polls, that way it can look once it is posted, how to block users from voting again, etc. I simply love it and will keep using it for sure. Hmm...probably the access to some options if you use the basic plan, but it is manageable. I would still definitely recommend Opinion Stage. Keep going the way you are going. The customer service is awesome, the platform is great. Just keep the way it is right now and I think more people will be encouraged to reccommend you to others, I make sure to do so constantly. Access to data from polls, limit of data, basically everything around polls. This is by far the most complete site. "an easy to setup, easy to use and efficient Quizz framework"
A very efficient integration in Wordpress, It gived me the ability to publish a personality quizz in minutes. as a non profit business, we needed to keep the link with our community. this was a great way to activate and even use the sharing capabilities to reach new people. "Great for creating various types of quick quizzes that can help draw traffic to your site!" The interface is very intuitive to use, making it easy to create different types of quizzes for your different end-goals. There is a place to add image attributions, so you can use whatever images you need to to make the quiz interesting, and still give credit to those that deserve it. They also have a WordPress Plugin that makes it easy to put quizzes on my blog. I was looking to add some custom html to the body of the results pages of the outcome quiz, but this feature was not available. In paid versions they have a feature where you can add a call-to-action button though, so once I get more popular and get the paid version of Opinion Stage, this problem will be solved. They provide a wide variety of quiz types, and have lead generation integrated into the paid versions, so if you have a budget for this and need leads, this may be the tool for you. I am trying to get more traffic to my site by having people fill out fun quizzes that fit the niche of my blog. I have only made a few quizzes so far and am just getting the hang of finding the right topics to make quizzes on, so the results are yet to come. It's a combination of using this great platform and finding the right topic that will create a buzz. "An amazing platform for our polling needs"
Opinion Stage is a great all around package, we've been using it to poll the followers of non-profit for about a year now. And after checking all the alternatives overall there's no better option. The UI design is sleek and it adapts well to embed in our website. The features offered in even the basic plans are everything we need. Customer support is great, quick to reply and super helpful. Not much really, if I had to nitpick a specific thing I'd say the results area where you see the social media accounts that voted on your poll could use some better display and filtering. But the security options to avoid duplicate voting are good enough that it's not really an issue unless you want to manually go checking for fake social media profiles and duplicate accounts. I should clarify that it's very specific to a big poll we ran last year, but that's the only issue I could find. It allowed us to run relatively high traffic polls without straining our own website or having to do the work of an inhouse solution. And it did it with low price and excellent quality. "Our go-to service for annual Bullion Dealer of the year Vote"
Ease of use - and excellent capabilities even in free version. The paid version handles huge traffic volume and I love that we can hid the vote results until the end of voting. The ads in the free version are not responsive - with a voting form in our sidebar at 280px, all adverts see half of their banner hidden which looks pretty bad. It's not an issue at wider widths. Free is great, but paid offers a huge amount more and is well worth it if you're seeing a decent traffic volume. "My bachelor thesis thanks you, Opinion Stage!" I used Opinion Stage for my bachelor thesis` surveys. None of the participants had any problems using the surveys. The surveys are optimisied also for tablets and phones, so everything could be filled out on-the-go. It is easy to make a survey and if 0.0001% you have a problem or a question you can ask the customer support - they answer in 1-2 minutes. There is nothing that I dislike, maybe because there isn`t such thing, I don`t know. I made only 4 surveys and everything went smooth. If I go deeper into the surveys world I might find something, who knows. The right for you if you need an easy set up survey/quizz. Like I said I`m using Opinion Stage for my bachelor thesis. I`m conducting some experiments about the crowdfunding updates. Do the updates, directly and indirectly connected to a technological product, influence on the participation of the donators. "Polls, Surveys, and Quizzes, Oh My!" We have used the polls feature to get some valuable feedback from the members of our club that we otherwise would not have been able to collect. The Trivia Quiz feature was a great way for our members to get familiar with the history of our club, and the survey tool works great for collecting even more information for our board of directors. The content is fun to build and looks great, especially since you have the option to add customized graphics for questions and answers. The results charts have also been helpful when compiling the data from the results. Am looking forward to trying out the Interactive story article to see how our club members participate with that feature. There are 8 different content types to choose from (polls, surveys, quizzes, slideshows, forms, lists, & interactive stories). It will take some time to give them all a try. Haven’t really found anything at this point in time to dislike. Everything appears to be working the way it was intended. Give it a try. You have nothing to lose trying out the free version. Most of our “business problems” (we are a not for profit club) have to do with should our club do this or should we do that. This is where the polls and the surveys really have come in handy. One of the unexpected benefits was being able construct quizzes about our club which has been a great educational tool for our members. "Awesome & Dynamic Software with Amazing Support Staff"
I don't know! Too much really to find a best.. its like asking.. what chocolate is best? All of it? On a serious note, it is very powerful but easy to use. You can tell a lot of work went into the interface to accomplish that. The more powerful software is, the more difficult the interface for the user usually is. So I know they spent a great deal of time really thinking about how their customers would use it. I appreciate that. The variety in poll types you can choose from is another HUGE gold star in my book. I looked high and low for a good "outcome" based poll. I am so glad I found this one. And the service... jeez... I work all kinds of hours and there seems to ALWAYS be someone there in the little chat box ready to answer questions or help me out. Amazing turn around time if its not instant, its within a couple of hours. Can't really ask for more. There is not a lot to dislike. I found a small issue where a tie in an outcome based poll is designed to just pick the first configured result. This was not optimal in my particular case, but it was easily solved by adding more questions to avoid a tie being possible. I currently am setting up a new site for a client that involves their users taking a quiz to determine certain things about them. These results are important because it drives the user on to purchase and is part of tailoring their whole experience with content and resources on the site. The main issue was that developing something like this from scratch would of been very cost prohibitive to the project. OpinionStage gave me the tools I needed to do this within my client's budget. We both are appreciative. "A very useful audience engagement tool"
I am using the Opinion Stage plugin to run polls on https://www.nokilltracy.org, a site promoting the end of the routine killing of animals in our local shelter. Opinion Stage gives me endless ways to engage our audience by posting questions on Facebook that lead back to the site for analysis. The software is very simple to use. Start with a simple poll and experiment. The polls work well and look good on the site. They offer a useful free plan that little sites like mine can actually use. So I won't criticize their pricing, which is fine for even small businesses but expensive for unfunded dogooders. But their free plan offsets any criticism. Is better than the WordPress plugin site might make it seem. Improves audience engagement and provides reasons to create original content that maps to the poll questions. Something to engage the Facebook community with. "Great for making shareable content"
That there are different options of quiz templates so that I can make something that suits any subject. I also love that there is the option to choose image or word answers for each. I have lost content because a window has closed without me saving (sometimes my fault and sometimes not). Be careful if you are someone used to sites that autosave for you! We are trying to build our brand with consistent material that appeals to our readers. These quizzes allow us to tackle a variety of topics in a fun and easily consumed way that is great to share on social media. Everything. It's slick and so professional looking. Super easy to use. Very intuitive. Ok, you got me, I can't think of a thing! I really like this product, it's intuitive - although it took me a little bit to work out hosting it on my site; HOWEVER, I admit I didn't read any "how to's" and I still worked it out fairly quickly! So not really the program's fault. It's not so much business problems as this program has just given me a really great tool to help educate our users about animal welfare all disguised in a fun quiz. "Helping boost the engagement and user experience"
This is an easy and a user-friendly tool to get data from your website and enrich it with visual possibilities. For example, thanks to the gamification aspect of the trivia option, it helps improve both the engagement to your web content and the user experience. Nothing that cannot be solved. For example, we would appreciate to have more customization options (fonts, colors, margins, pictures sizes, etc.). If you hesitaste of using Opinion Stage, please, try it once and you will realize that is a very useful tool that will help you both improve and enrich your web content. We have included trivia tool as a new, funny and easy way to lead the user to more complex, scientific contents. "Opinion Stage let us easily start engaging with our audience"
Our ongoing HIV health awareness campaign finds that our audience engages with interactive content a lot. Its a great addition to our blog-posts and social content, and makes our engagement much more fun. 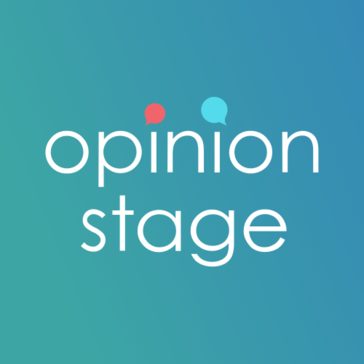 Opinion Stage lets us quickly and easily put some pretty advanced advanced audience interaction together! Have not come across anything we would like to have changed as yet. With opinion stage we are able to entertain them with fun quizzes, or poll them to collect data, run vital surveys to learn about them — allowing us to increase traffic, drive engagement, and at the same time collect vital data on, and from, our audience. "A Delightful Tool For Making Quizzes"
It just makes the task of creating elegant quizzes so easy. Instead of bothering about how my quiz will look and whether the software would be full of bugs, I can focus on the questions. The refreshing time when saving a draft (esp. if you are doing it multiple times) can be a little slow, but that's probably because of its many features. There was one aspect of the quiz that didn't seem to work when I was using it, but the tech team has assured me that the bug would be taken care of soon. I already knew that most people enjoy a quiz if presented to them in an interesting way. Opinion Stage just makes the process easier. "Best Survey Plugin I have ever used"
It is user friendly and it makes it super easy to create almost any kind of survey. I was really surprised when I first started it. Super helpful! I believe the plugin matches all of my requirements. Therefore, I haven't found anything I dislike. Truly recommend it. This excellent software allows you to make anything from bespoke polls to quizzes, in seconds - and amend them just as quickly. The results look excellent on the page and they can add enormous value to your site. There is nothing I dislike about this platform! This is a must-use as far as I am concerned. I am a professional journalist of some 43 years standing, who is building a new, campaigning News website for my community. The polls, in particular, are fabulous for engaging my audience and for getting their feedback on the issues on which I am fighting for them. Likewise the quizzes will add much interest to the site, whnich is about to come out of beta shortly. "Opinion Stage is the best tool to use for any contest!" I like the fact that is an easy to manage plugin within the WordPress platform and by using Opinion Stage is helping us to help those who help others within the non-profit community. I strongly recommend the Opinion Stage team. They really know what they do. I love the functionality in this tool, therefore there is no dislike at all! "Excellent for Polls and Surveys!!" Opinion Stage is great because you can create effective and eye-catching surveys and polls that are very attractive to your audience. We really like it because we can use lots of photos and videos on our surveys which is great for our audience. Nothing at the moment. All our experiences have been great so far! Its a great tool to reaching out to your audience to learn about their wants and needs. We use it for our audience to find out their desires and needs in our industry. A great tool! Many issues we have had was with reaching out to a large audience. With Opinionstage they make it super easy to do just that and the responses are easy to read and understand. "Great Tool for Creating Content"
The ability to make interactive content for use on our website and for posting in social media. It can be difficult to find enough photos to make the content really pop but that's not really Opinion Stage's fault. Think about what you are creating before you set out to implement it. The best content is well planned and thought out. We are hoping to solve the issue of having fresh and engaging content for our visitors to the website and our social media platforms. Works better than promised. The customer support was outstanding and I'll be happy to use it often. The way the screens of the quiz appear are a bit like PowerPoint (full screen without transitions), and I hope they'll upgrade that experience soon. It is important when you have to download a new plugin on WP to be as much easy possible. And Opinion WP plugin can be used with closed eyes. I'm just collecting some data about the preferences of the albanian persons for the technology. "a flexible solution for communicating with our participants"
The fact that website visitors can easily change their opinion polls at any time! nothing at the moment. already knew that most people enjoy a quiz if presented to them in an interesting way. try it today, it doesn't disappoint! I can easily get to interact with my audience and supply them with content based on their vote tallies. "Great for quick and easy quizzes"
The ease of use when creating quizzes. The ability of the site to resize images for you, so I don't have to. How quickly it can get embedded onto a site. Not being able to move around answer easily with questions. You should really give it a try if you're looking for a quiz based site. The site also offers other products that come with the memberships, and should be looked at as well. A quick an easy solution for clients to interact with employees. "Great support. Cool product with options. " The support. We had some specific needs and they were very helpful. No dislikes. Very happy. No product is perfect but we love this one. Make sure to try all features during development as you will often be asked to upgrade. We used to have users answer a series of questions to determine which vehicle model is best for them. We port that to Mailchimp and get a contact out of it. Its awesome and the users love it. So much better than trolling for newsletter sign ups. OpinionStage is easy to use and is a great alternative to BuzzFeed for businesses looking for a fun way to engage their customers. There are plenty of options for personalization and implementation. Nothing to dislike! They even are willing to work with and help nonprofits! Opinion Stage is a fun way to engage our customers while promoting subscriptions. "Perfect for whatever you want to create!" The simple user interface when creating quizzes. Also the dashboard is easy to navigate! "Nice tool for poll and quizzes"
It's very user friendly and you can make as many polls as you would like! I would like to be able to change the text for the additional own answers. We needed several different polls and couldn't find a solution like yours! "Excellent options for polls & surveys"
We use the wordpress plugin feature which allows us to survey our clients with ease. "Great tool for our marketing team"
We used Opinion Stage to ask our e-magazine readers about their experience. Creating the survey tooked few minutes and we appreciated the attractiveness of the Polls & Quizzes. We weren't able to push the survey to the next level by adding logic jumps. "Very easy to use and friendly for new user"
I like the interface most. It's very easy to use and the information is very clear. I dislike the price , it's too expensive for user. The vote. We use the vote function to make a election. "The best embeddable polling tool available"
I like the fact it's embeddable, responsive, and customisable. If you are looking for a tool that allows you to embed on your website / blog then this is the tool for you. "Simple to use, good analytic tools"
Improve response rate by digitalising survey, where you wouldn't have that high by physical contacts, and whom you may not be able to reach out by conventional means. "A quick and easy to use tool for surveys"
I liked that it's easy to control and there are many options. You can disable the things you don't want to appear. The statistics of the survey could show the percentage of answers. We wanted to know what our show do listeners like. Simple and customize able. Used it for blog posts that require polling. Not the prettiest looking interface on the user facing side. Worked as a solid way to add user content and opinions. "Simple to use website survey"
Easy platform for survey within website. No ability to save responses on own site. Website usability survey - getting instant responses from visitors to our website. * We monitor all Opinion Stage Poll, Survey & Quiz Maker reviews to prevent fraudulent reviews and keep review quality high. We do not post reviews by company employees or direct competitors. Validated reviews require the user to submit a screenshot of the product containing their user ID, in order to verify a user is an actual user of the product. Hi there! Are you looking to implement a solution like Opinion Stage Poll, Survey & Quiz Maker?